Late yesterday, I checked the Facebook to find out that my friend Gina, the Goddess of Pie, has sold her cafe, Gina's Pies are Square. I knew it was for sale, and I knew she wanted to venture in other directions, but this floored me. Like I somehow thought all was right in the world if the pie shop was just the way I remember it, and my one-time apartment above was there just in case I ever needed it. Not that I'm thinking I'd need to escape my current life, but the time I spent in that 500 person town was a good time. I knew everyone, everyone knew me. I only had to drive to visit my Parents or to get to church, and could walk everywhere else that needed getting to. My apartment smelled of pie, and the outside brick wall was emblazoned with a Gold Medal Flour sign. Idyllic? Kinda. I learned how to make jewelry by taking on a second job, I learned how to co-exist on a basic level when people know your business all of the time. I remembered what it was like not to have curtains on the windows. And if I saw you coming in the front door, I'd probably already have the coffee cup (or beer bottle) at the ready for you. 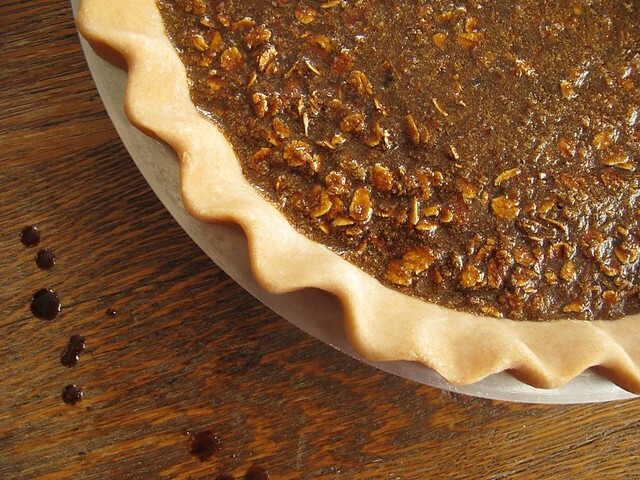 Of course, this news right before retiring for the day led me to dreaming of pie... and what better pie for Pi Day (3.14) and St. Patrick's Day than Gina's Guinness Oatmeal Stout. I'd considered making it for awhile, but knew that I'd be eating a whole pie, so didn't really know if I would be making it for sure. After reading Deena's similarly mathematical post on Coupled Pair (Pear) Pie and hearing of the changes going on at the Square Pie, I knew that in my own way, I'd make a pie as tribute today. The good news is that if you have the Guinness, you can probably do it without leaving to pick up ingredients if your baking pantry is the slightest bit stocked. The pie recipe is one we made at the Square Pie, courtesy of the GOP. I hope I can still call her the Goddess of Pie, since the thought of her relinquishing that crown is truly a sorry one. The crust recipe however, is from Dorie Greenspan's Baking Book. I can not believe I never made it before, because I think it is the nicest crust I've ever made. I mix it up mess free in a plastic bag as Alton Brown suggests. Whisk all ingredients except beer until well combined, then add beer. Mixture will foam up nicely. Pour into pie shell and bake at 350 degrees for 40-45 minutes. Pie should be set and not "sloshy", but will set up a bit more as it cools... kind of like pecan pie filling. Let it cool to room temperature before digging in. Put the flour, sugar and salt in the food pro and pulse to combine. Add butter and shortening and pulse several times until mixture is like "coarse meal" and has several "fat pea" sized butter pieces floating around. Add about half the water, and continue pulsing, adding enough water and increasing duration of the pulsing a little to get the water into the flour. When the dough comes together when pinched, you have succeeded. Dump the food pro contents into a plastic bag and form into a disk. Refrigerate for 1 hour (and up to 2 days) before rolling out. As if this Guinness Pie isn't enough to make your knees buckle, I rolled out the extra pie dough that I clipped off the crust, and figured that if these Chocolate Covered Katie Fudge Babies that I am hopelessly addicted to are good on their own, perhaps they would be even better wrapped up in flaky dough. All I am going to say is that it's a good thing I only had enough dough to make three of these (newly dubbed) Pastry Enhanced Fudge Babies. I used a 2 5/8 inch ring to cut them out, but next time could go a bit larger. I also had to tear off (and eat, of course) about 1/3 of the Fudge Baby as pictured above, so that I could crimp the sides of the dough up around it. I brushed the edges with beaten egg, but since I only had a few, used the same beaten eggs in the Guinness Pie recipe. Nothing was wasted in my adventures, today. It's not raw or vegan anymore, but I've got to think that CCK would be impressed that her Fudge Babies could be even more addicting! Good luck to GOP and her new endeavors, and farewell to the Square Pie of my past. I hope your new owners take good care of you.